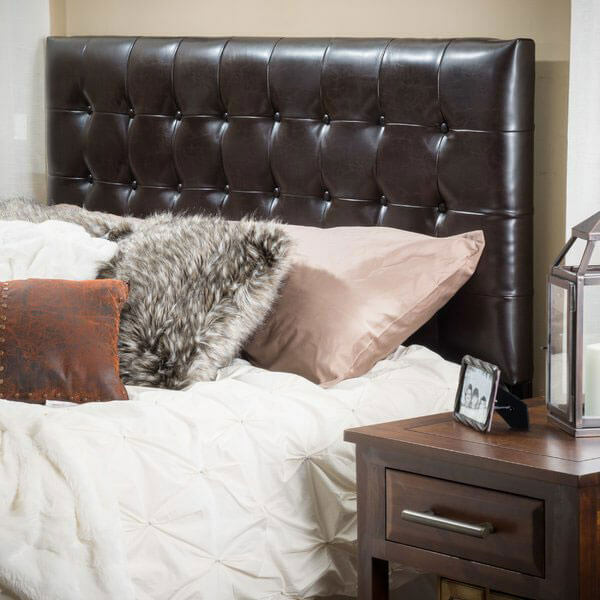 Upholstered with genuine, luxurious brown leather, the Lansing Adjustable Brown Tufted Leather Headboard is a button-tufted headboard that will add elegance to any bedroom. It measures 79.75 inches in length by 31.5 inches in width by 49 inches in height and can be adjusted to fit any California king or standard king bed. The Zinus Faux Leather Upholstered Top Stitched Headboard offers a rustic-looking leather headboard that can complete any room. Available in a queen size, this headboard measures 62.5 inches in width and features an adjustable height of 43.5 inches to 51.5 inches in total. 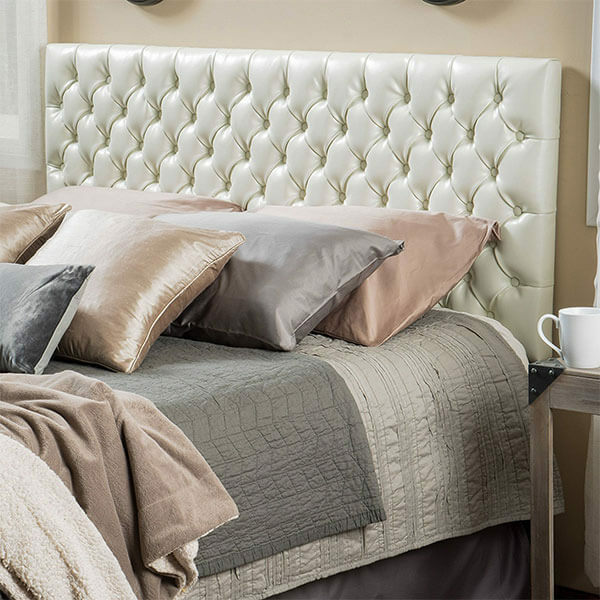 The versatile headboard features espresso-colored faux leather. Sophisticated and traditional, the Dorel Living Faux Leather Headboard is a sturdy headboard that features a rich, espresso brown faux-leather upholstery that comes with two instances of nickel-colored nailhead trim. It has been lightly padded for your comfort and fits on both queen- and full-sized beds. 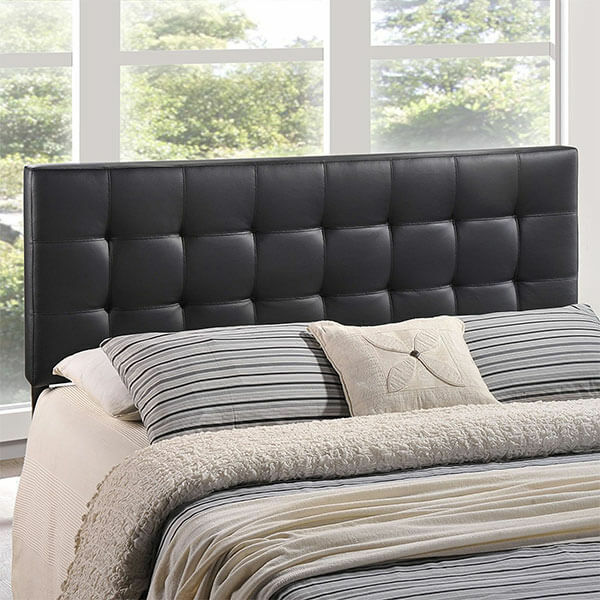 With its handsome black faux leather and its luxurious button tufting, the Baxton Studio Faux Leather Headboard can add charm and elegance to any bedroom. It offers a durable rubberwood frame that comes with foam padding for just enough comfort when reading or relaxing in bed. With its geometric tufting, the Modway Lily Upholstered Tufted Vinyl Headboard is a modern twist on classic-style button tufting. The furnishing has been given a tufted, checkered design and is made out of durable materials such as plywood and fiberboard. The sleek leather adds the perfect finishing touch to its sophisticated look. Bring classic elegance into your bedroom with the Denise Austin Home Cannes Adjustable Bonded Leather Headboard. The headboard features iron and wood in its design and is completed with bonded leather upholstery in an off-white/ivory color. Able to fit into any space, the furnishing features adjustable height to suit your specific bed.